Take Route 9 North to Route 72 West. At the end of the expressway go straight. At next light turn right. Travel about 4 miles to the 8th traffic light. (former Chic Miller Chevrolet on your right). Turn left onto Route 69 (Wolcott Street). Entrance to the school is on your right about 1/2 mile past the South Side Elementary School. Take Route 9 North to Route 72 West. Turn right onto Route 229 North. The high school will be on your right. Turn RIGHT onto SIGOURNEY ST, Turn LEFT onto Asylum Street. The school is at the corner of Woodland and Asylum. Take next right into parking lot. Take Route 3 North (Putnam Bridge toward Glastonbury). Cross over the bridge, follow signs to Route 2 West (left lane), take the first exit off of Route 2, (Main Street), go straight through the first light, at the second light (7-11 will be on the right), take a right on Brewer Street. Continue on Brewer Street until a four way intersection, at the stop light take a left onto Forbes Street. High School is on the left. Take I-91 North to Exit 44, follow connector east to route 5, at light turn onto Route 5 South, go 4 lights and the High School will be on the right. Take I-91 North to Exit #46. Turn Right onto King Street / US-5. Continue on US-5 to 1264 Enfield Street. Take I-91 North toward Hartford/Springfield. Take exit 47E (CT-190 East) toward Hazardville/Somers. Turn Left onto CT-192 / North Maple Street. I-84 West to Exit 39 ( CT-4 Farmington ). Continue on Farmington Avenue for 3.7 miles. Pass Route 10 - Pass Brickyard Road. At the second light turn right on Monteith Drive. The High School will be at the end of the road. Take CT Route 3 East across the Connecticut River. Take CT Route 2 East towards Norwich Take Exit 7, CT Route 17 South exit towards Portland. Take the second right, exit on Hubbard Street. At the end of the ramp turn Left, the High School will be on the right. Head West on Wells Road (CT-175) into Newington, turn right onto CT-173 (about 2.5 miles), turn left onto New Britain Avenue, (CT-71), then right onto South Main Street. Go approximately 4.5 miles, school is on the left. Take I-91 South to exit 3 - Trumbull Street. Continue on Trumbull approximately .2 miles and turn Left at Temple Street. Go .2 miles and turn Right at Grove Street. Grove Street becomes Tower Parkway. Bear Right and head towards Whalley Avenue. Bear Right at Whalley Avenue. Turn Right on Sherman Avenue. School is on the Left. Take Exit 60 and at the end of the ramp stay in the middle of the three lanes. Turn RIGHT onto Middle Turnpike and stay in the LEFT hand lane. 1/4 Mile follow as the lane bears LEFT through the traffic light. Turn RIGHT at the next traffic light onto West Middle Turnpike. Travel STRAIGHT through 7 TRAFFIC LIGHTS. At the 8th Traffic Light turn RIGHT onto BROOKFIELD STREET. Follow Brookfield Street to the FIRST STOP SIGN. Turn RIGHT into the rear student lot, adjacent to the fields. Take I-91 South to exit 17 to exit 67. Turn right on Main Street. At the first light turn right on Gravel Street. The High School will be on the right. Take Wells Road ( Route 175) toward Newington center to Willard Avenue ( Route 173). Take a right onto Willard Avenue. High School is on the left. Take I-91 towards New Haven, merge onto CT-9 South via exit 22S on the Left toward Middletown / Old Saybrook, turn right onto CT-17 / St John's Square. Continue to follow CT-17. CT-17 becomes CT-17A / Main Street. Turn Right onto Spring Street. Turn Left onto High Street. Exit 64-65. Ramp divides. Bear left. Ramp divides again, bear right to stop light. You are on Route 83 North. Go to the 7th stop light on Route 83. Turn right on to Loveland Hill Road. The school is on the right at the top of the hill. Take I-91 South to Exit 24 (Wethersfield/Rocky Hill). Turn right onto Route 99 North (Silas Deane Highway). Turn Right onto parsonage Street, then turn left on Chapin Avenue. The High School is on the right. From I-84, Take Route 4, Exit #39. This is the Farmington exit. Go to the second set of lights and make a right turn onto Rt. 10 and 202. Farmington Country Club is on the corner. Follow Route 10 to Route 44 (about 5 miles). Make a left turn onto Route 44. Continue until you come to Route 167 (Bushy Hill Road), and make a right turn. At the end of Route 167, take a left on Route 309. Simsbury High School is on the right side. Enter at the second driveway - this brings you to the front of the school. Take I-84 East to exit 62 (Buckland Street), left off exit onto Buckland (CT-194 North), continue on CT-194 past Route 30, turn right on Sand Hill Road, then left on Nevers, school is on the left. ·Go approx. 1 mile on Queen Street. to Flanders Street. ·Turn left onto Flanders Street. From I-91 North, take the Exit 34 -Wilson. Go left at the end of the off ramp and take the 1st left onto Windsor Avenue (towards Hartford). Windsor avenue becomes Main Street. At the 4th light, take a right onto Tower Avenue. Travel on Tower Avenue for several miles. Cross over Blue Hills Avenue, (Saint Francis Hospital will be on your left), and continue on Tower Avenue until you reach the School (at the intersection of Granby Street). The Gym is around the rear of the school. 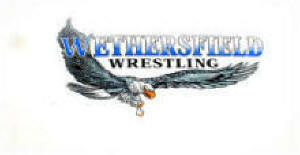 This site is sponsored by Wethersfield Wrestling Alumni to promote the advancement of scholastic wrestling.